With a goal to focus exclusively on Criminal Law and Canadian Immigration Law, Jagdeep is dedicated to represent individuals before various Federal and Provincial courts, Boards, Tribunals and Departments. Jagdeep is a founding partner of Dhaliwal & Dhaliwal LLP. With a strong interest in law and an objective to pursue career in law field, Jagdeep attained his under-graduation degree in Political Science, Economics and Public Administration. He attained his B.A., LL.B. and LL.M. degrees from India. 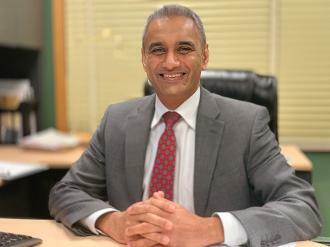 After his call to the Bar in India in 1999, he practiced Criminal Law in India for nine years before immigrating to Canada. He also taught Criminal Law in the Universities and Law Schools in India. Jagdeep completed his accreditation from the University of Toronto. While studying in Canada, he assisted various Toronto based Immigration Lawyers. Currently, he is a member in good standing of Law Society of Upper Canada, Criminal Lawyers Association, Canadian Bar Association and Ontario Bar Association. Apart from English, Jagdeep is proficient in Punjabi, Hindi and Urdu.